News by Britta S., Matt C., Matt S., and Trent P.
There’s a new Bravely Default game heading to mobile soon (in Japan), which means a new fairy mascot: Rinne. With her bright green wings, she’s more colourful than any other fairies we’ve seen yet, and cuter too — sorry Anne and Airy, but it’s true. Rinne’s reveal comes courtesy of a new trailer for Bravely Default: Fairy’s Effect. The video consists mostly of concept artwork set to a voice-over introducing the game’s story. Naturally, crystals are the centrepiece, and it’s described as a “time shift story” about light and dark, hope and despair. No doubt Rinne will play a big part, too — Bravely’s fairies always do. The end of the trailer also offers a glimpse of combat. It takes a similar approach to the main games, with the same Brave and Default mechanics, but there also looks to be a new system whereby you can organise your party across three rows. It retains the Job system as well; jobs confirmed so far include Knight, Thief, Ranger, Black Mage, and White Mage. Bravely Default: Fairy’s Effect is due out later this year in Japan for iOS and Android. Sadly, there’s been no announcement of a Western release just yet. … It does. It so very, very does. 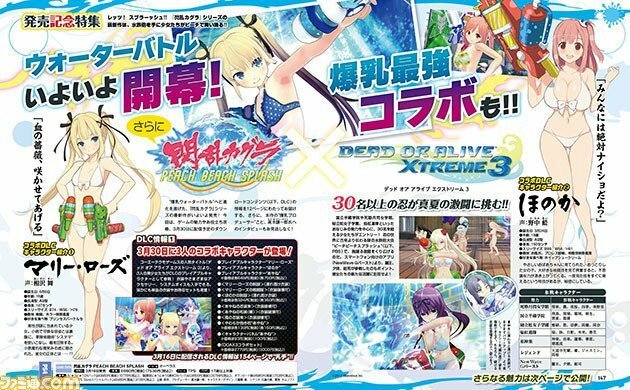 As part of all the big announcements in the lead-up to the most gloriously pervy game to be released in 2017, such as its imminent Western release, a mobile game and a half-hour gameplay video, we now know that there are going to be DLC characters in Senran Kagura: Peach Beach Splash. Not just any characters, either. Really good ones. Marvellous has announced a partnership with Koei Tecmo to bring Marie Rose and Honoka, from the Dead or Alive series, to the squirt-em-up. Marie Rose is quite possibly the most popular character that Koei Tecmo’s ever produced, and Honoka’s okay, I guess. They’ll both be fully playable characters in the game, and to be completely honest, they (especially Marie Rose) will add much needed variety to the cast. See, most of the girls in Senran Kagura have chests that can only be described as impossible. And that, of course, is the series’ sense of humour and it’s play on the pin-up tradition. But for those of us that prefer more normal sized graphical assets, we’ve been largely left out of the development team’s consideration (yes I know there’s Ryobi but she has a transformed mode that makes her like all the other girls anyway). Marie Rose fixes that singlehandedly, as she really is perfectly normal proportioned. Anyhow, can you tell we’re excited about the game? Cause we are. I know I am ready to finish Breath of the Wild, while shrines and other collectables still position themselves across the land I can save Hyrule quite soon. Nintendo is hoping to keep the Zelda and Switch momentum going by releasing a three-part video documentary series covering the development of the title. Nintendo promises the video series will enlighten you on how the world of Hyrule in The Legend of Zelda: Breath of the Wild relates to Kyoto. Where did the game's musical inspiration come from? How were the sound effects for Link's footsteps created? Which time period in Japanese history inspired the Sheikah Slate? This video series comes off the back of the Nintendo Zelda GDC panel that has been uploaded here. Change and Constant: Breaking Conventions with ‘The Legend of Zelda: Breath of the Wild’ was was a great panel presentation on the development of the game. However the new video series approaches the content as a documentary, with three videos approximately 10 minutes long. Starting with the beginning, the series progresses to discussion on the open world development process before finishing the series with a video on the story and characters. The first video is attached above, but make sure you watch the others in the series by heading over to Nintendo’s Youtube page. I had a hunch when I first reported on Utawarerumono in January that this game would be special — and I think this new trailer by Atlus, together with the recently released story trailer “Trouble is Brewing in Utawarerumono,” shows us enough to warrant high expectations. The trailer focuses on the "unlikely hero" named Haku. He is afflicted with that terrible anime disease, amnesia, but that hasn't dampened his laconic humour, which gives you an instant feel for his character. He turns out to be a brilliant strategist — jolly useful in a strategy game — and I just love the way he flourishes his fan in battle! There will be two DLC characters available on launch day: Tamaki (sword) and Sasara (spear). Each have a swimsuit costume and samurai costume. Utawarerumono: Mask of Deception launches on May 23 in the Americas and Europe for PlayStation 4 and PS Vita, and I just can't wait to unfurl my fan.